Note: Our work is paying off. We recommend that EVERY town petition an article to withdraw from their associated Regional Planners, as a first step toward taking back local government from the NGOs and federales! Or likewise, DEFEAT any article that asks to spend money for the renewal of membership in any Regional Planning organization. This entry was posted in Alton, Lakes Region on March 15, 2018 by GSF. If you are a resident of Brookfield, Farmington, Middleton, Milton, New Durham, Wakefield, or Wolfeboro, this may interest you. The unveiling of Moose Mountain Regional Greenway’s NEW Regional Conservation Plan: ‘Our Home, Our Land, Our Tomorrow’ will be held from 5:30 – 8:30 PM on Tuesday, July 18, 2017 at the Pinckney Boathouse, Brewster Academy, 80 Academy Drive, Wolfeboro. MMRG’s Conservation Planning project was supported by funds from the sale of the Conservation License Plate (Moose Plate) through the NH State Conservation Committee grant program and by the Jack and Dorothy Byrne Foundation, the Davis Conservation Foundation, the Adelard A. Roy & Valdea Lea Roy Foundation, and other generous donors. Sponsors Parkers Accounting and Wentworth Watershed Association. This entry was posted in Brookfield, Lakes Region, Miscellaneous on July 1, 2017 by GSF. Here are some files that pertain to the Lakes Region plan, including the Granite State Future findings and recommendations. These ideas may show up on your ballot this spring. This entry was posted in Lakes Region on December 19, 2016 by GSF. Update: There will be a meeting at 6:00 PM on the 26th of January at the Interlakes High School auditorium. It’s my belief the town Selectmen feel the roundabouts will relieve the heavy traffic that descends on the center of town during the summer months, especially on Friday and Sunday afternoons. I’m a full-time syndicated newspaper columnist and always try to look at facts when it comes to a problem. Let’s consider some facts. I was chair of the Roads committee in my OH village when I was a Councilman. I’ve chaired meetings with traffic engineers when we were considering a roundabout at the intersection of Ridge Road and the Ronald Reagan Highway in Amberley Village, OH. When you’re in a small committee meeting like this, the engineers tend to let their hair down especially when the public rarely attends. It’s in situations like this where you get the real lowdown. The traffic engineers stated in my meetings that ALL ROADS are designed for average or slightly above-average traffic flow. ALL ROADS and intersections WILL BECOME CONGESTED in periods of heavy traffic. That’s a fact. Here’s an extreme example. Interstate 93 in Concord, NH is just two lanes north and south. Most of the time, it’s rarely backed up with traffic, even on Friday afternoons in rush hour. Proof of the traffic engineers’ statements is right here in our own state. All you have to do is be at the enormous roundabout on the west side of Portsmouth, NH any morning or afternoon. I’ve been stuck in a lane of traffic trying to get into that roundabout on the eastbound leg of Route 16 as it enters the roundabout. Once it took me 15 minutes to get into the roundabout where drivers thought they were at the Bristol Motor Speedway. – Routes 3 and 25 through Meredith to the Mt. Washington Valley and the northern parts of Lake Winnipesaukee don’t have viable alternative routes. Here’s the bottom line if you look at the above facts. If you’ve never been parked behind a person afraid to enter a roundabout, you’ll forever remember it when it happens to you. It’s very frustrating as they hold up ALL the traffic behind them. If there’s an accident in a one-lane roundabout, like the ones proposed for Meredith, the entire intersection becomes GRIDLOCKED. That does not happen in a regular cross intersection as cars can navigate around the accident. With the current computerized traffic signals at the intersection of Route 3 and 25, traffic flow through the intersections is handled as efficiently as possible. You normally don’t have to wait but a few minutes before your traffic light turns green in your favor. Pedestrians wanting to cross Route 3 and Route 25 now have safe crossing signals. 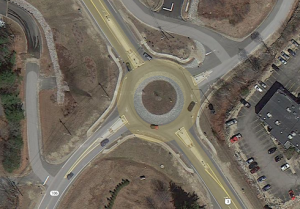 It will be VERY DANGEROUS to cross a roundabout on foot and it will bring traffic in the roundabout to a screeching HALT as pedestrians have the right of way in NH – ALWAYS. One thing is for sure. If the roundabouts are designed like the one just south of the McDonald’s restaurant in Meredith, NH, it will cause even MORE congestion since the diameter of that roundabout is too small. The small diameter allows fewer cars into the roundabout at one time and those in the roundabout travel SLOWLY to navigate the roundabout. Now let’s consider modern technology in this discussion. 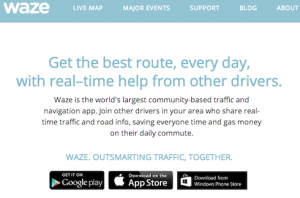 These apps are causing major traffic jams in residential and business districts all over the USA. Don’t believe me? Just go to Bing.com and search for yourself. What do you think this means for the shortcut down Waukewan Street and Main Street in downtown Meredith? It’s already gridlocked on Fridays in the summer. 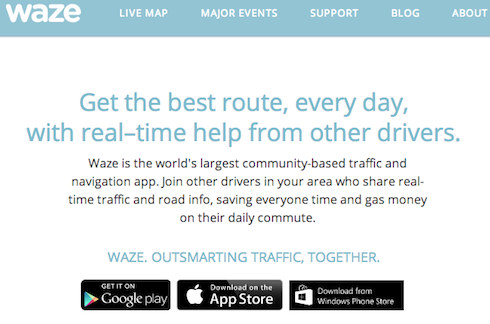 That gridlock will now spread to other connecting roads through town as the apps will show other secondary routes to be open. Here’s my prediction. Traffic on Route 3 passing the town docks will be gridlocked by people using the apps who are told to go through town on Main Street. The constant heavy traffic flow passing through town and into the roundabout from the west to continue on Route 25 towards Meredith Neck and points beyond will BLOCK all those people on Route 3 trying to enter the roundabout as they approach it from the south. Once a line of cars enters the roundabout because there’s no traffic coming in from their left, this flow blocks all the other entrances into the single-lane roundabout. Don’t think for a minute that all the harried tourists or part-time residents are going to be courteous drivers and allow each leg of the roundabout a chance to merge. You don’t have to be a traffic engineer to understand or imagine this scenario. 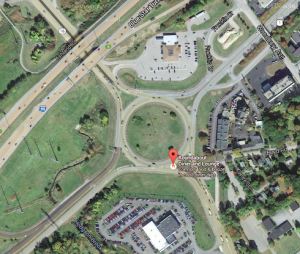 SUMMARY: The Meredith Roundabouts are not a great idea. They’ll not solve the congestion problems. They may create WORSE secondary problems. They’ll cost the citizens of Meredith MORE MONEY over time. Meredith will have to sign a legally binding contract with the Federal Government and give back all sorts of things in the future to get the money for the project. Can you prove beyond a reasonable doubt that the roundabouts WILL SIGNIFICANTLY relieve traffic congestion? If the answer is “Yes”, can you present that documentation to me? This entry was posted in Lakes Region, Meredith, Miscellaneous on January 18, 2015 by Admin. In Alton, the residents held an informational forum on the Granite State Future program which seeks to change zoning and planning for regional areas in NH using HUD grants as the money as obtained by the Lakes Regional Planning Commission. Listen carefully.. another reason to attend your town meetings and stop HUD’s use of grants to force economic and racial integration, mixed use housing, cluster housing, bike paths, commuter rails, parks, food and farm control programs and even interference in the educational system. Remember, RPCs make ‘suggestions’ but once you sign onto that HUD grant, their ‘suggestions’ become a MANDATE. “Workforce Housing” means a broad range of owner and renter housing, meeting the needs of families and individuals that represent the majority of New Hampshire’s diverse workforce and whose income is generally below 120% of the area median. Workforce Housing is permanent housing, intended as a primary year-round residence, that is available to households regardless of age. This entry was posted in Alton, Lakes Region on September 27, 2013 by Admin.